If you are in the market to purchase a home but your credit has a few dings and your funds for a down payment are less than 5%, there is still hope. An FHA home loan is designed for this exact kind of circumstance. The following article describes the basic guidelines of an FHA mortgage. FHA is the acronym for Federal Housing Administration. This organization was created by the Department of Housing and Urban Development (also called HUD) back in the year 1934. The goal of the organization was to help people obtain affordable housing all across the USA. FHA provides rules and guidelines for lenders to offer the FHA mortgage. FHA does not lend money. Here are the basic requirements for most customers applying for the FHA loan. Mortgage Insurance – this is a fee paid to the lender. This fee helps cover the risk of default. Normally, the amount of mortgage insurance is 0.85 of the annual loan balance, distributed over 12 monthly payments. Debt to income ratio – The maximum amount of debt payments, including the proposed FHA payment, cannot be over 43% of the borrower’s gross monthly income. There are a few exceptions in very unique situations. Employment – must be able to document a minimum of 2 years of work history either through W-2 forms and pay stubs or business tax returns plus personal tax returns for self-employed borrowers. Occupancy – the borrower must intend to live in the home as their main residence. FHA does not approve loans for vacation homes or rental properties. Home value – the value of the home will be determined by an official appraisal of the property performed by a certified FHA appraiser. Co-borrower that does not live in the home – FHA has a unique feature called the non-occupying co-borrower. In simple terms, this means that a parent, or grandparent, can sign on as a co-borrower of the FHA loan even if they do not intend to live in the property as their main residence. This allows a family member to use their income to assist a younger, working relative to purchase a home. Student Loans – Borrowers should be aware that future student loan repayments will be calculated as part of the debt to income ratio mentioned earlier. Although there are a few more rules for the FHA loans, these are the most common items that will impact the majority of borrowers. One of the most appealing features of the FHA loan is the low amount required for a down payment. FHA only asks for 3.5% of the home’s asking price as a down payment. Furthermore, the money used for the down payment can be a gift. The down payment may come from a family member, a local charity, or the borrower’s employer. So long as the transaction of the gift is properly documented, there is nothing wrong with an FHA borrower using money that came from someone else for the down payment. A local mortgage lender can help you with documenting the gift as well as drafting a proper gift letter. We briefly touched on the private mortgage insurance topic earlier. The mortgage insurance comes in two forms for all FHA loans. First, there is the mortgage insurance premium paid at the time of closing. This amount is 1.75% of the loan. Secondly, there is the annual mortgage insurance premium. The annual amount is calculated each year based on the outstanding balance of the loan and then distributed over the next 12 payments. As of July 3, 2013, if a borrower made a down payment on their home under 10% and used FHA to finance the loan, the annual mortgage insurance premium will be in place for the remainder of the loan. Borrowers have the option of refinancing the home to a different type of loan after the balance is paid down in order to remove the private mortgage insurance. With average credit score and the ability to use a gift for a down payment, it is easy to see why many potential homeowners turn to the FHA mortgage as a means of buying a home. 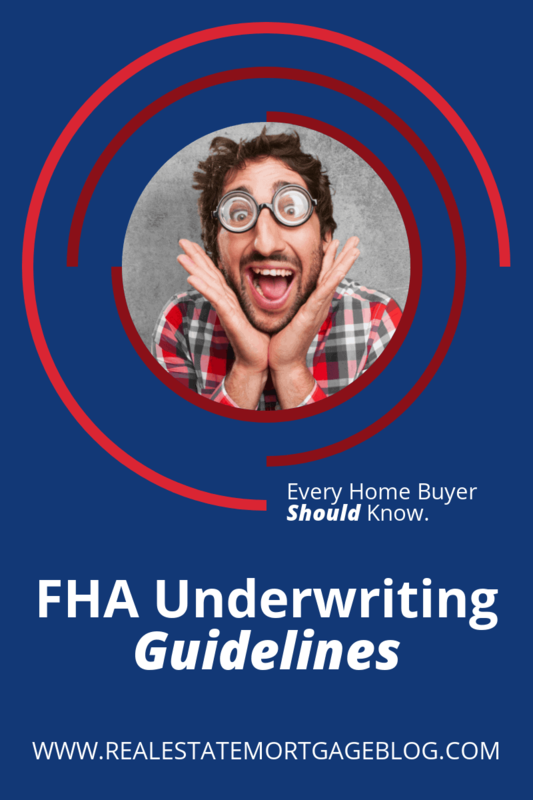 About the author: This article on “FHA Underwriting Guidelines That Every Home Buyer Should Know” was written by Luke Skar of www.MadisonMortgageGuys.com. As the Social Media Strategist, his role is to provide original content for all of his social media profiles as well as generating new leads from his website. MadisonMortgageGuys.com and team provides award winning customer service to clients who need to purchase a home or refinance an existing mortgage. Our branch currently serves Wisconsin, Illinois, Minnesota and Florida. On our website you will find state specific mortgage program information for all states such as information on USDA Loans in Minnesota. Looking To PRE-APPROVE For A Mortgage? Visit www.MadisonMortgageGuys.com to learn about your mortgage options including first time home buyer information, FHA, VA, USDA, conventional, 5% down jumbo loans, no money down options, renovation loans including FHA 203k and Fannie Mae HomeStyle, 2nd homes, investment properties, state specific programs and many more! If you found this article helpful, please consider sharing it with your social network! Luke Skar is a 16 year veteran to the mortgage industry. He strives to stay up to date with the latest changes and trends in mortgage lending as well as real estate. Through his blogs, websites and social media accounts, his goal is to help the community with as much factual knowledge as possible that helps all parties in real estate transactions. Thanks for the information. Excellent read. Sign-up for EXCLUSIVE content. Be the first to read EXPERT real estate and mortgage tips!